In this age of the Affordable Care Act (ACA), health care management is under pressure to do more with less. You face the contradictory goal of slashing per-capita costs while improving quality of care and enhancing patient experience. How your organization responds in this environment will determine how regulators, investors and the public evaluate it. One way to demonstrate compliance, cooperation and commitment is through the judicious investment in assets that both lower costs and help improve outcomes—assets like the Imorgon Ultrasound Enhancement System™. Lower capital investment. The system is software driven, so it requires no additional workstation hardware, minimizing your IT footprint. It fully integrates with existing ultrasound systems, radiology PACS and workstations, thus limiting the need for additional IT support. Reduced imaging costs. The Imorgon System provides a high level of diagnostic accuracy and confidence that may reduce the need for repeat imaging exams. Greater workflow efficiency. The Imorgon System streamlines imaging workflow and improves the end-to-end speed and accuracy of the diagnostic ultrasound process. Manpower efficiency and productivity. 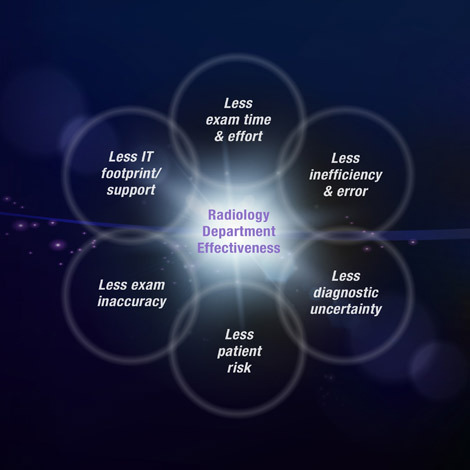 Imorgon enables institutions to realize human performance efficiencies through more streamlined and informed radiological reviews. Communications between imaging staff are also improved, enabling them to process more studies in less time. This higher productivity helps offset the impact of declining ultrasound reimbursements. Documentable compliance support. Imorgon’s accurate and complete integrated electronic reporting helps ensure alignment with electronic health records (EHR) meaningful use initiatives.